Changing our behavior based on unexpected cues from our environment is an essential part of survival. The ability to drop what you’re doing when circumstances demand it could mean the difference between avoiding a speeding vehicle or getting hit by it. A new study at the Okinawa Institute of Science and Technology Graduate University (OIST) has delved into a brain mechanism that may regulate such adaptation. 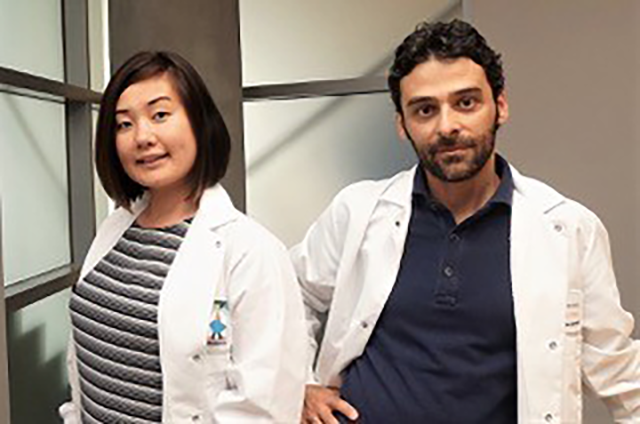 In the study, which was published in eLife, researchers led by Dr. Stefano Zucca at the OIST Neurobiology Research Unit investigated nerve cells in the striatum, a brain region involved in movement and motivation. Here, nerve cells called cholinergic interneurons (CINs) are in a near-constant state of activity, releasing a chemical called acetylcholine every time they fire. But if the brain gets an unexpected stimulus from outside the body – for example, a startling sound – the CINs will briefly stop firing. To find out, his team manipulated CIN activity with a method known as optogenetics. They used a virus to replace sections of these neurons’ DNA with genes encoding for light-sensitive ion channels. Optical filaments were then implanted into the striatum of mice. By shining a laser beam into the cell along the filaments, the researchers could switch the CINs into active or inactive mode as the mice moved around their cage, allowing them to generate pauses in CIN firing at will. 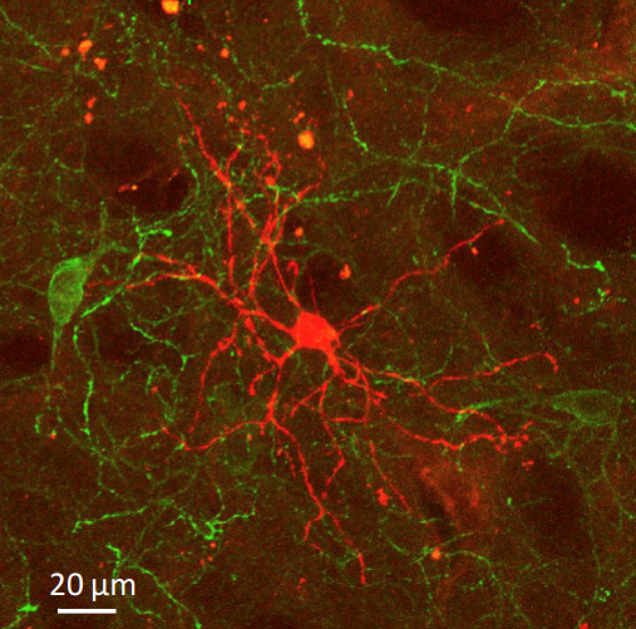 Florescent imaging of a section of the striatum showing Cholinergic Interneurons (CINs) in green, and Spiny Projection Neurons (SPNs) in red. When they generated the pauses in CIN activity, the researchers observed a knock-on effect on the neurons that CINs connect to—neurons called spiny projection neurons (SPNs), which in turn send signals from the striatum to the rest of the brain. During the pauses, because SPN neurons received lower stimulation from CINs, they were less likely to fire themselves, the study showed. These pauses, then, give interrupting events significance by effectively muting the striatum’s output signals. The stops and starts in CIN activity may be a mechanism for controlling how animals respond to stimuli from their environment, says Wickens. For example, he said, “this mechanism might regulate how an animal stops eating when it hears an unfamiliar sound”. The researchers now plan to explore the phenomenon in more detail. “Next we’d like to see if this pause is happening everywhere in the striatum at the same time, or if it’s limited to specific locations”, says Prof. Wickens. That will help reveal how it affects behaviors from moment to moment, he adds.